PETRA III, which took up operation in 2009, is the most brilliant storage-ring-based X-ray radiation source in the world. It offers outstanding experimental opportunities for scientists who want to investigate very small samples or require tightly collimated and very short-wavelength X-rays for their experiments. At present, 20 undulator beamlines (including 3 EMBL beamlines) with about 40 experimental setups are operated in the three PETRA III experimental halls 'Max von Laue', "Ada Yonath" and "Paul P. Ewald". More beamlines will be available to users in the coming years. PETRA III is operated at 6 GeV nominal energy in top up mode. The vertical beam parameters are close to the diffraction limit and hence are very similar to other high-energy 3rd generation sources. 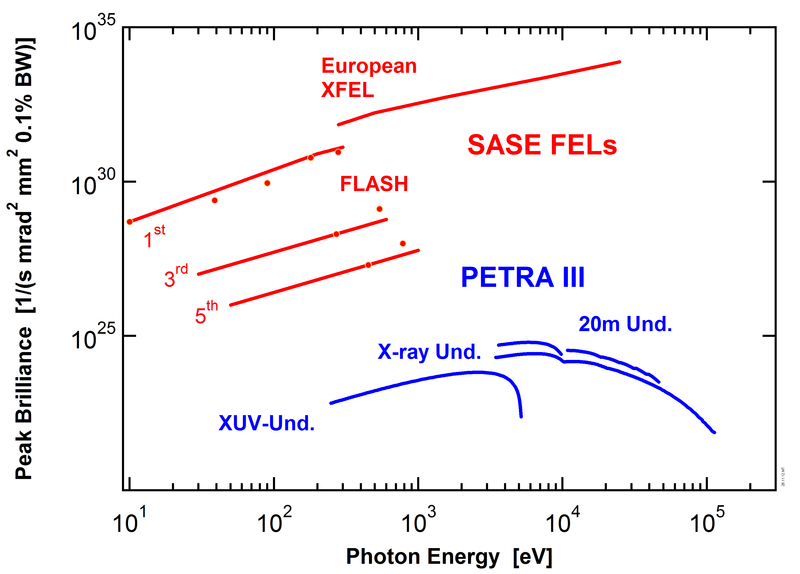 However the major improvement provided by PETRA III is the extreme small horizontal emittance (~0.01 nmrd (rms)). This µm-sized brilliant X-ray beam gives researchers vital advantages. For example, even minuscule material samples can be studied at PETRA III and the arrangement of their atoms precisely determined - or molecular biologists can explore the atomic structure of tiny protein crystals. PETRA III also opens many different opportunities in the field of materials research. For certain applications, materials researchers need highly energetic photons with high penetration power - for example, to test welding seams or to check production parts for signs of fatigue. The call for regular proposals for PETRA III is published twice a year. The deadline is regularly on 1 March and 1 September of each year.